It is so common for anyone to say that they are going to begin running in the new year, and start strong only to taper off when life starts getting too busy. New Year’s Resolutions can be extremely helpful to motivate you to reach the goals that you have, but you need to stick to them. Here’s our guide to making sure that you succeed in your New Year’s Resolutions this year! This may sound slightly backwards, but bear with us. The reason that you want to do this is that you start with a commitment. When you sign up for a race, you have to choose what distance you want to be able to run and the date that you want to be able to run it by. A race can also give you the motivation that you need to actually follow through with your resolution and to “walk your talk”. When working on your new year’s resolution, it’s important to write them all down, even the smallest goal you would like to accomplish. Once you have all of your goals set, create a workout plan. This will help give you an understanding of how you will be able to reach those goals that you have set. Place your workout plan in a place where you will see it every day as a reminder to follow through with it. Often times, when people begin running or start getting into running again. They start very aggressively. Seeing how far they can run or how fast they can run, leaving them too sore the next day, or next couple of days, to accomplish their workout plan. It’s better to start easy and work your way up to more challenging accomplishments. That being said, once you are in your workout routine, it will be important for you to push yourself, and yes feel sore, in order to reach those larger goals that you have. This sounds so cliché, but it’s a rut that we all fall into. So many people are ready for other things that they put before your fitness. They have work, errands, or other busywork that they put in the way. Absolutely, there will always be other things that you can do instead of running, and there will be days when you just don’t feel like it. But just remember, your health always needs to come first. You already made a commitment and you need to be able to do what you set out to do. Part of the reasons why people love doing races is that they are always so much fun! You can choose a race that works with your fitness level and you will get a cool medal once you accomplish it. When you do a virtual race, you get to run at your own pace, which makes it a great option for any beginner that wants to start running. If this is your first race, it’s best to start small when it comes to your goals. You need to be practical about what you can and cannot accomplish. For example, if your current running speed is approximately a 9-minute mile, don’t expect to be able to run a 6-minute mile in the course of a few months of training. Decide on a goal that is doable but will still be a challenge for you. Not only is it a good idea to create goals that are related to the race itself, but you will also want to develop goals that are training related. Of course, you will want some goals that help you with your training regimen, such as committing to train every day or every other day, but it is also a good idea to create goals before each training session. This will give you something to focus on for that session and it can give you a boost of confidence when you are able to stay focused on your goal. Yes, there is some competition when it comes to virtual races, but they are really about self-improvement. You really shouldn’t be thinking about what place you are going to be in or how many people you want to be ahead of, but think about how you can better your abilities through your virtual race. Maybe for this race, you are going to try for your personal best, or maybe you are going to run the entire race without stopping to walk. Of course, one of the most exciting moments of the virtual race is when you finally get your medal. It’s great to take some time to look back at what you were able to accomplish and to celebrate what you were able to achieve. Get some friends and do something that you enjoy doing. This is a great way to involve loved ones in your virtual race as well as your fitness journey. When you are able to complete your race and accomplish everything that you had set out to do, it just makes victory so much sweeter. Virtual races make it so much easier for you to have the ability to focus on yourself, because you aren’t comparing yourself to others when you are in your race. Find a race that works with your fitness goals and have fun with it! 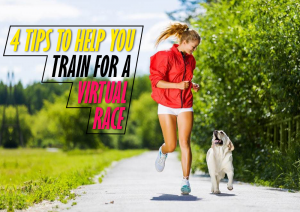 Just as with any type of race, it is important to do some training before your virtual race. When it comes to starting your training for a race, there are some things that you should think about to help you complete your race and have a fun time doing it. There are certain things that many runners do in order to prepare for races. Here are some things that you can do so that you have a great race day. Another good thing to do before you begin training is to create a training plan. Decide which days you will spend running and figure out how long you will run on each of these days. This will help you stay focused on your goals and will give you a schedule that you will want to stick to. Running buddies simply make training more fun! You have someone to talk to when you are doing all of the training and you will have some one to race with when your do the virtual race with. Having a running buddy can help you stay accountable during your training. Since they will be doing the training as well as you, they can make sure that you stick to the training plan that you have created for yourself. Your environment can make a huge difference on your training and your mindset when it comes to your race. One of the benefits of doing a virtual race is the fact that you are able to run wherever you want to run. Whether you prefer running on the treadmill or you enjoy running outside, it’s your choice. Find that place that makes you feel great when you are running so that you can have a wonderful time during your training and during your race. The most important part of any virtual race is to have a great time. You can have a fun time while you are training too! Training for your race not only helps you be prepared for your race, but it also can make you more excited for race day. We want to make sure that you truly treasure that medal after all of the hard work that you do after your training.